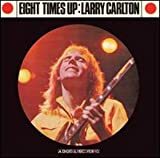 Larry Eugene Carlton (born March 2, 1948) is an American guitarist who built his career as a studio musician in the 1970s and '80s for acts such as Steely Dan and Joni Mitchell. He has participated in thousands of recording sessions, recorded on hundreds of albums in many genres, for television and movies, and on more than 100 gold records. He has been a member of the jazz fusion groups The Crusaders and Fourplay and has maintained a long solo career.